Yeah good work dude. The design and colours suit the shape well. I have completely finished the warlock. I will have pictures up tonight or tomorrow. 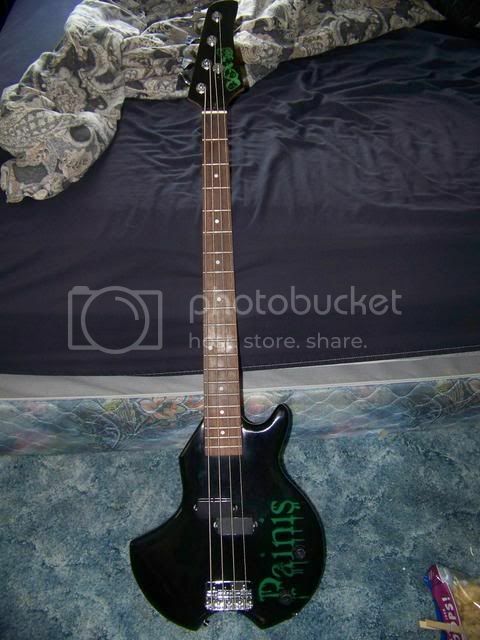 its nice a shiny now.. lol Also, does anyone know where I can find parts for a warlock platnium series bass? like a parts like anyway. I was thinking of getting black hardware for it. I think that would look sweet on mine. thanks. Since you're in the US... why don't you try BC Rich themselves? They quite probibly won't sell them to you but it's worth a shot. 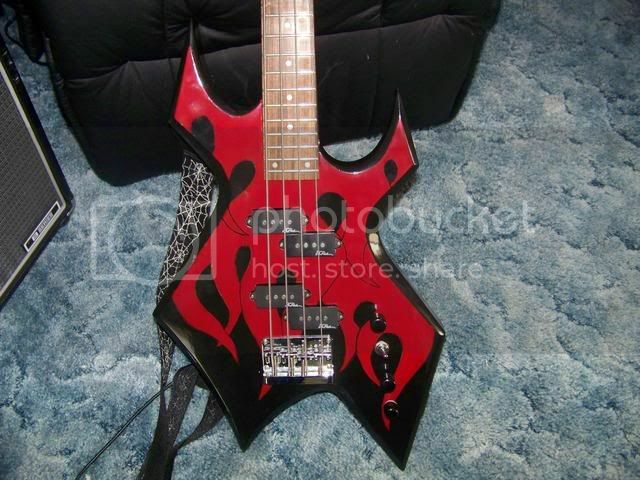 Other than that try and contact BC Rich Wholesalers. They often have spare parts and are more likely to sell that sort of thing to you. Heres the moment you all have waited for!! Completely wetsanded and polished! Enjoy! Yeah that's brill! Great work. Really suits it! Fantastic! It really does suit the bass. Hope you are really pleased with it. I'm very pleased with it. It came out better than I thought it would. I love it! 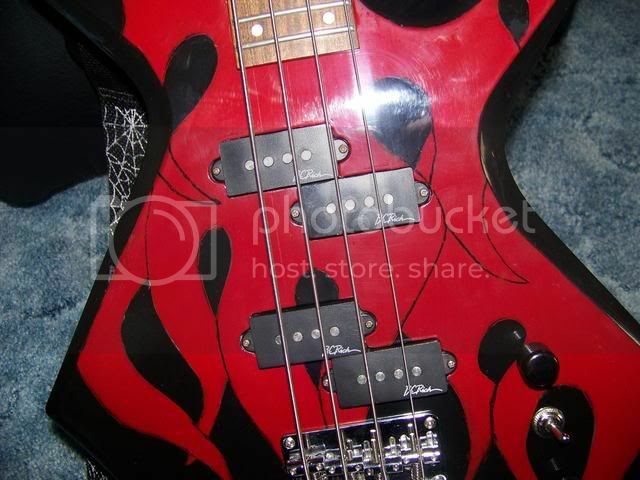 I have another bass that I did I will post pictures of that soon. Now I am working on my friends guitar. You're gonna get really good with all the practice! I know. I love painting/repainting guitars and basses now. I want to make a business out of it. 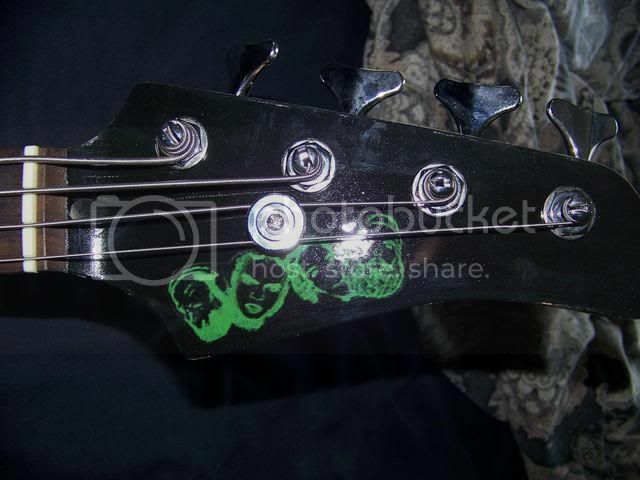 Here are the pics of the other bass I painted for someone. 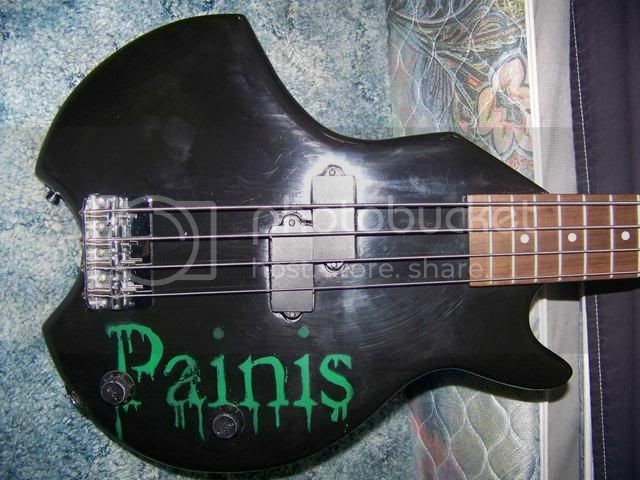 its a themed basses for a band I'm friends with. I warn you all now that you will not like them, but its there for those who wish to know who they are. How have you done the words... just totaly free hand painted or stencils? Is that a handmade bass? Never seen a shape like that. the shape of the bass and the band is horrid .just an opinion. Yeah, I know no one will like the band. But the letters were stenciled on, and the logo is a cut out and glued on. Ahh right!! I was thinking a computer vynil cutter might be great to create detailed stencil design... what do you recon? 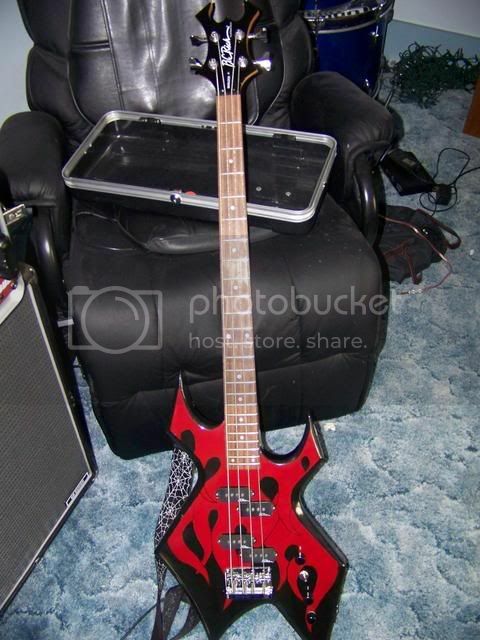 it was originally a firstact bass and my friend cut it up in his shopclass. I made the stencil out of a print out of the letters and cut them out and taped it up.